EPA Administrator Scott Pruitt defended the Trump Administration’s massive cuts to the EPA budget before a key House subcommittee on Thursday. The plan to dismantle our environmental protections was not well received – by either party. The criticism of EPA Administrator Scott Pruitt at a budget hearing Thursday illustrates the difficulty Trump will have enacting his proposed spending plan for fiscal 2018. His blueprint calls for spending $54 billion more on defense and offsetting the increase with steep cuts to nearly every other agency — including 18 percent from the Department of Health and Human Services, 28 percent from the State Department and 21 percent from the Labor Department. The EPA faces some of the steepest cuts: a 31 percent reduction that would result in 3,200 employees being culled from the agency’s 15,000-member workforce. The “trimmed” budget he referenced would amount to a cut of more than 31 percent, or $2.4 billion annually — a larger percentage than at any other federal agency. The administration wants to rid the EPA of thousands of employees and sharply reduce or eliminate a variety of national and regional programs. The pattern: Just as senators are inclined to defend the budgets of Energy Department labs that employ residents of their states, House members are inclined to defend EPA programs that they believe benefit their constituents. So what did Committee members have to say? Here’s a summary of Representative questions (and Pruitt non-answers). Tom Cole, R-Okla.: “When I see the Indian Environmental General Assistance Program (GAP) cut by $257 billion and see state and tribal assistant grants cut by $678 million, and I see a $69 million cut in the pollution control grant program of the Clean Water Act which has a section on tribal guidance, that worries me . . . So when you make these cuts [given current tribal taxation law], how will they make up those monies, particularly given the biggest recipients tend to be the poorest tribes and the most isolated land masses and areas with the most limited economic tools available? There’s a big difference between states and localities that have taxing powers and Indian tribes that don’t,” Cole said, explaining that it would be difficult for tribal government to fill the vacuum left by the EPA. Rep. Kevin Calvert R-Calif. (Subcommittee chair, hailing “from California’s smoggy Inland Empire” ) used his time to question Pruitt on whether he’d continue to honor California’s waiver allowing the state to pursue tougher greenhouse gas standards for motor vehicles. The auto industry and some conservatives have pressed the Trump administration to rescind California’s waiver, but Pruitt said it was not currently under review. (Note the qualifier “currently.”) Listing cuts to the Targeted Air Shed Grant Program (and other EPA programs) Calvert said, “these are all proposals we are unlikely to entertain.” Riverside County, in which Calvert’s district sits, received grants to address ozone and particulate matter pollution for the 2016 fiscal year. Calvert also criticized a line in the budget that would eliminate a program for reducing diesel emissions. Pruitt said Superfund “is absolutely a priority,” and said he would boost the program’s “accountability.” Many projects have languished on a national priority list for decades without “direction, leadership, and, in some cases, answers for how we’re going to remediate sites,” he said. As a former Superfund enforcement attorney, I’d note that Congressional funding cuts to the Superfund program caused more delays than “direction or leadership” within EPA. Moreover, some 70% of Superfund sites are cleaned up by responsible parties working under negotiated, court-approved settlements with EPA – that;’s the way Congress set up the program. 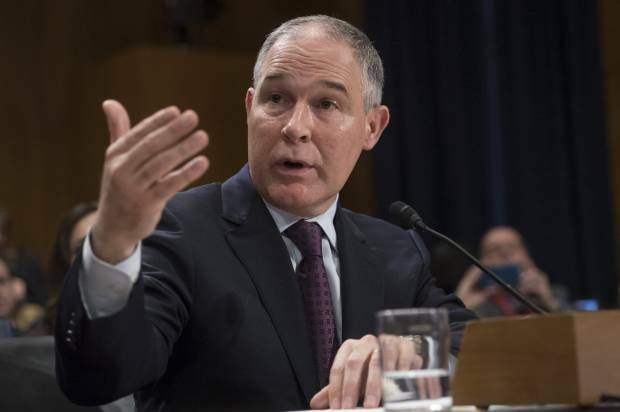 Negotiations take time – as do the careful scientific studies and engineering analyses required to provide that legal “certainty” Pruitt is so fond of invoking. Trump & Pruitt propose cutting EPA enforcement staff by ~ 20%. What kind of “direction and leadership” does that suggest? Since 2003, EPA’s Superfund program has wrangled nearly $20 billion from responsible parties to clean up contaminated dumpsites and bring these abandoned properties back to life. That is far more than the agency spends on enforcement, and budget cuts will just stick taxpayers with the tab for these cleanups. Civil and criminal enforcement settlements since 2000 have required violators to commit nearly $150 billion to install scrubbers and other air pollution controls, upgrade sewage treatment plants, restore damaged watersheds, and take other actions to protect air and water quality. Violators have paid more than $6.4 billion in penalties to the U.S. Treasury or restitution to victims since 2000, more than offsetting the cost of maintaining these enforcement programs. In 2016, for example, civil enforcement by the agency was responsible for $13.7 billion in environmental projects and injunctive relief, as well as $1.4 billion in civil penalties. Criminal enforcement last year brought $207 million in restitution and fines, and $775,000 in court-ordered environmental projects.